Learning Tarot is an incredibly rewarding experience that is practical to use in everyday life while evolving and expanding your personal Spiritual growth. You are invited to come and change your life by learning to understand the symbolism that is found deep within the Tarot Cards. These cards and their symbolism, permeate cultures, religions, and time itself. Exploring the Tarot is a tool to understanding your own life, and your life’s journeys from Ancient times to today... and beyond. 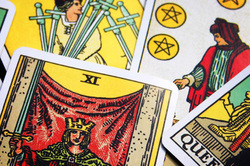 Learning Tarot is an incredibly rewarding experience that is practical to use in everyday life while evolving and expanding your personal Spiritual growth. Tarot is not just a divination system, it is a Book of Spiritual Knowledge. Learning to read this book ‘unlocks’ the hidden keys, and energies it holds. Class size is limited to 14 people. As a result, pre-registration and a deposit is required to hold your spot. This class is appropriate for beginners or anyone wishing to further their understanding of the tarot and it’s mysteries in a deeper way. You will leave this course with enough knowledge of the cards to begin using them right away. Deeper insights are continuously available to the dedicated seeker who studies the cards. Tarot can sometimes seem a bit overwhelming or too large to tackle but, learning the Tarot with Oz`s unique teaching methods is not only Insightful ~ it is Fun & Easy! Please bring a notebook and a Rider Waite tarot deck, Radiant Rider Waite or Universal Waite deck of tarot cards to class. Tarot Decks are available for purchase at Circle of Light prior to class. There is much to unravel in the Tarot. At this workshop you will learn information you cannot find in books. Well worth it for the novice to the expert! The Tarot are are a Beautiful system of knowledge. They are portable, practical, and powerful. Class size is limited to 14 people. Please bring a notebook and a Rider Waite, Radiant Rider Waite or Universal Waite deck of tarot cards to class. Due to limited space, pre-registration is required. Book now! After a quick review of the material covered in Level 1, the Advanced class will focus primarily on doing readings; interpretations and layouts. There is a need in spreads for figuring out times, dates, and ages, which are covered in this course. All participants will be giving and receiving readings in order to check accuracy and to to maximize the degree of detail that can be tapped at deeper levels. All will be able to interpret a Tarot spread by the end of this course. Oz will also be revealing, the advanced two deck card spread, which is very difficult to perform, and which he uses personally for extreme pinpoint accuracy. Learning Tarot is an incredibly rewarding experience that lends itself to everyday life and personal Spiritual growth. Tarot is not just a divination system, it is a book of Spiritual Knowledge. Oscar De Los Santos (Oz) makes the keys to tarot attainable for anyone to learn and use. He has studied the Tarot for over 30 years and has incredible knowledge and understanding of these cards. He is a well known and well respected reader and teacher. His Tarot readings are incredibly accurate, and his insights and knowledge of the cards is formidable. He believes learning the Tarot should be mandatory for those on a spiritual path as they reveal deep mysteries and secrets to 'those who have eyes to see'. More About Oz HERE.